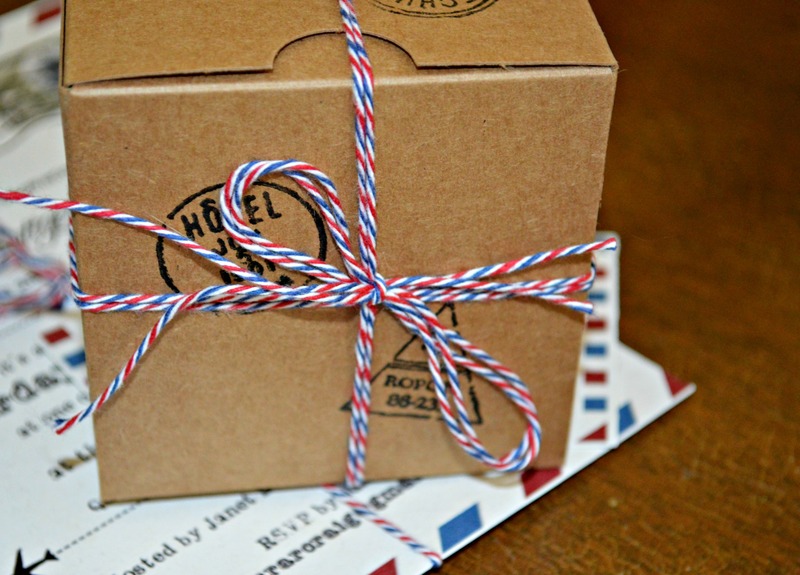 To make the favors for our “Baggage Claim” at the travel-themed shower, I used small gift boxes, a “postage meter” rubber stamp set from Michael’s, and my “airmail” baker’s twine. 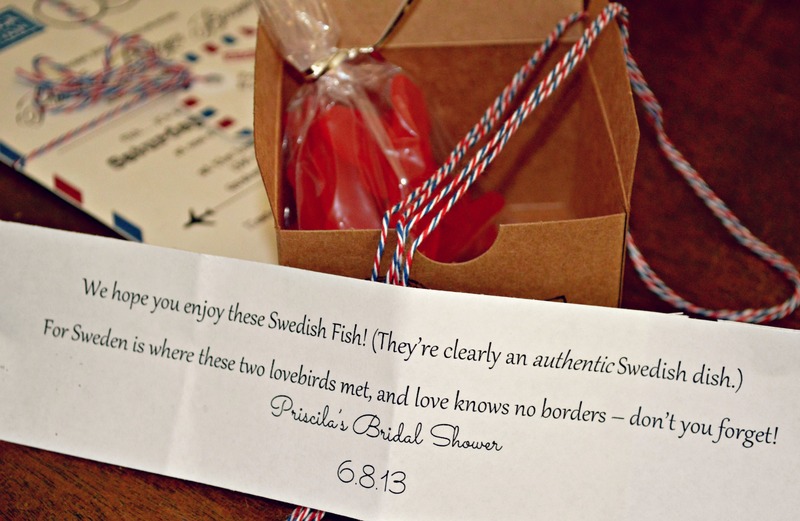 Since Mike & Priscila met in Sweden, we filled the boxes with Swedish fish! 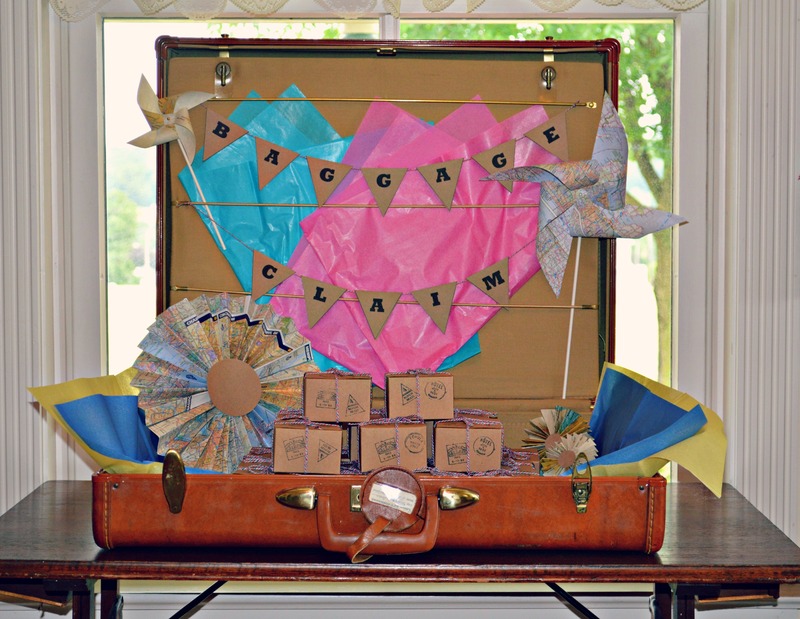 We displayed them inside an old suitcase – really driving home that ‘travel’ theme with our “Baggage Claim” display! 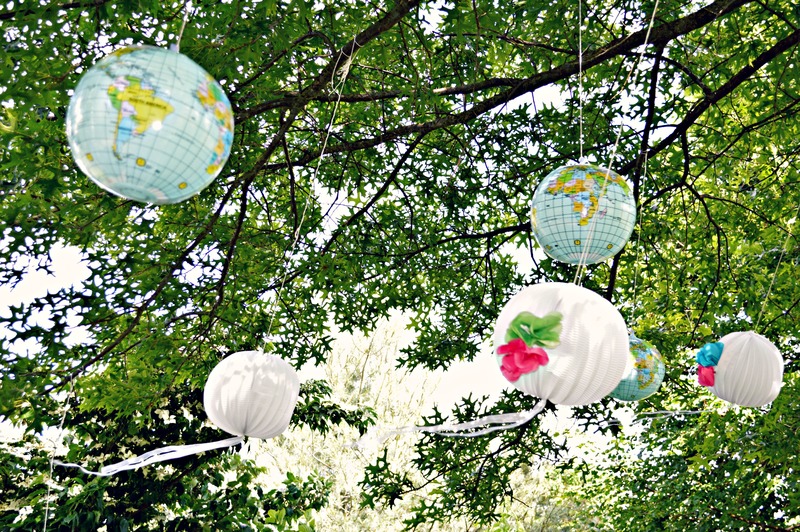 Possibly my favorite part of the decor for Priscila’s travel themed bridal shower was the lovely hanging display of globes and paper lanterns in my parents’ oak tree. My father and my uncle Gary teamed up to hang the collection of globes and lanterns from the tree branches – with my father bravely hopping up on a ladder to string them up! 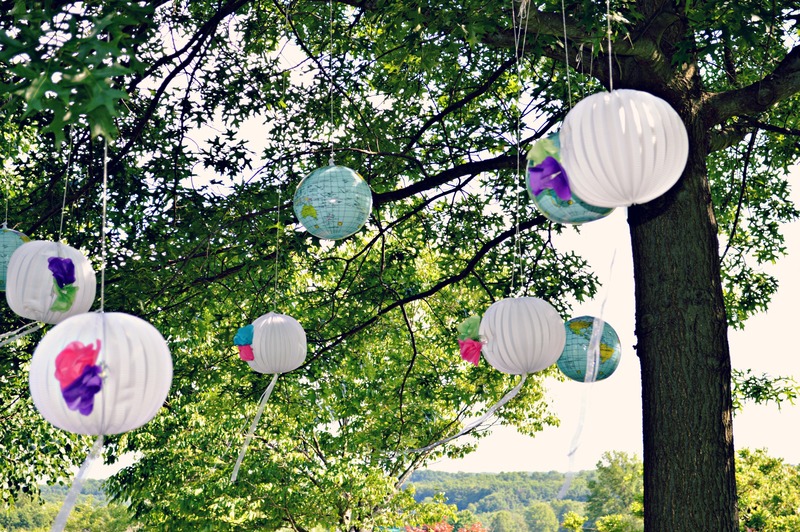 The inflatable globes are from Oriental Trading Company, as are the white paper lanterns. 1. Cut four sheets of tissue into 6×6 inch squares, and fold the square twice over. 2. Cut a petal shape through the folded sheets, and then open the layers and lay them on top of each other in alternating directions. 3. Fold the sheets in half, and cut a small slit through the center, than slip some floral stamens or – in my case – q-tips (nothing like working with what you have, right? 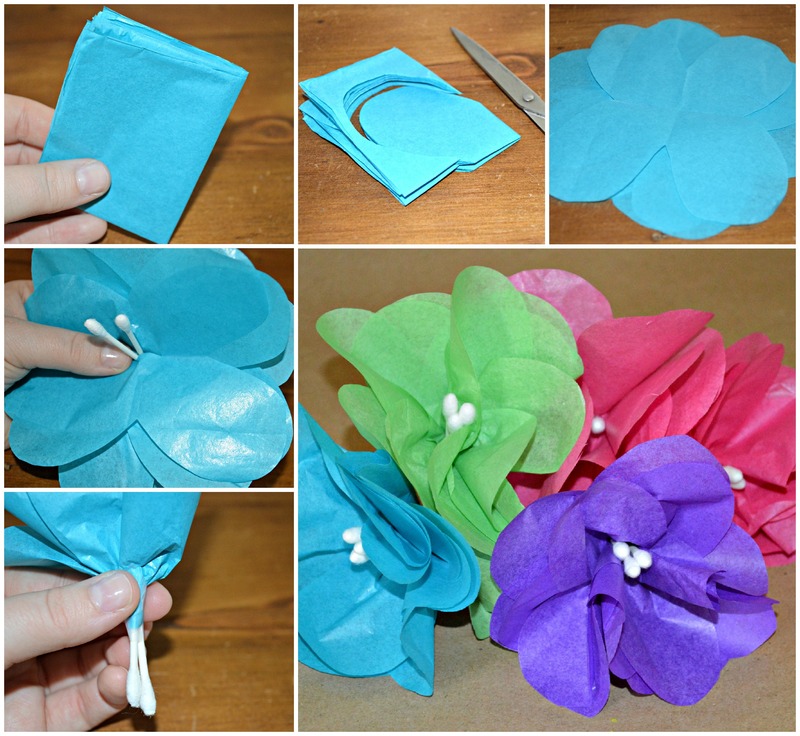 ), and fold the sheets up to form a flower. 4. 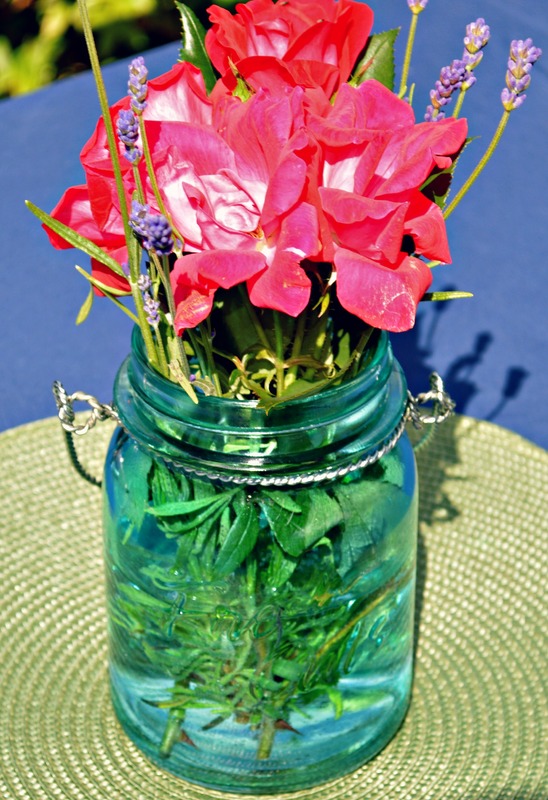 Simply wrap some clear tape around the base of the tissue & stems to secure the flower. Give ’em a fluff and you’re set! 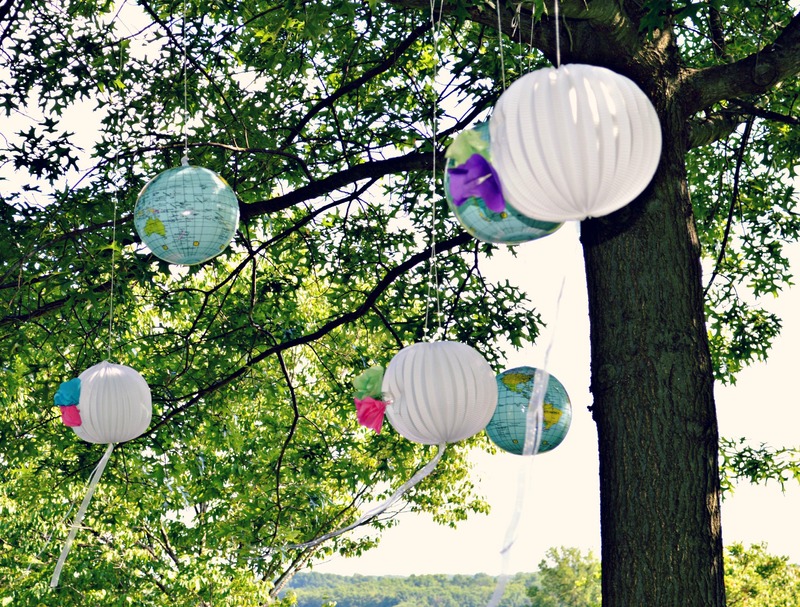 I hot glued the flowers to the sides of the paper lanterns, and glued ribbons to the bottom. I loved the way the ribbons blew in the breeze all afternoon. It was like a little magical fairyland out in our backyard! 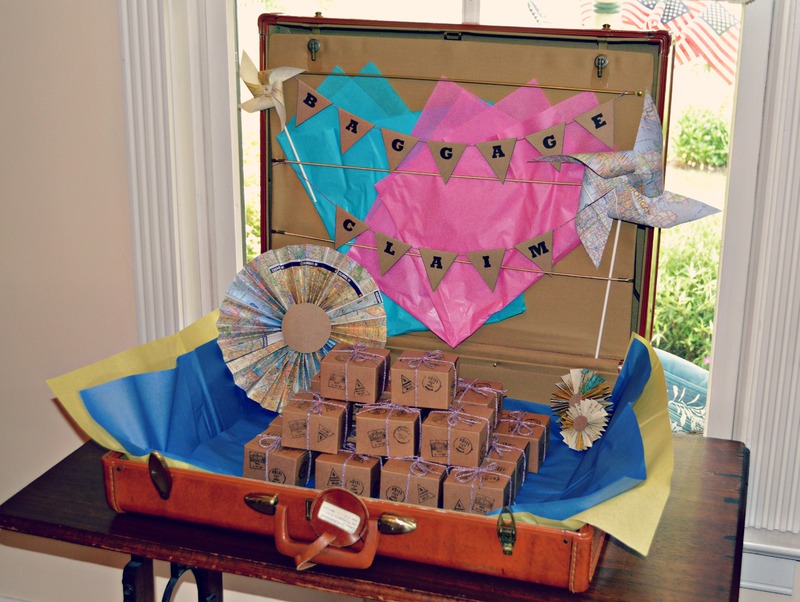 My mother and I teamed up to create the lunch menu for Priscila’s travel themed bridal shower. Our goal was to feature foods from the four main countries that are important to Priscila and Mike – the U.S., Sweden (where they met), Peru (where Priscila is from) and France (where they took a special trip to Paris together). We hosted just over twenty people, and had more than enough food to go around (that’s a sign of a great party, right?!) 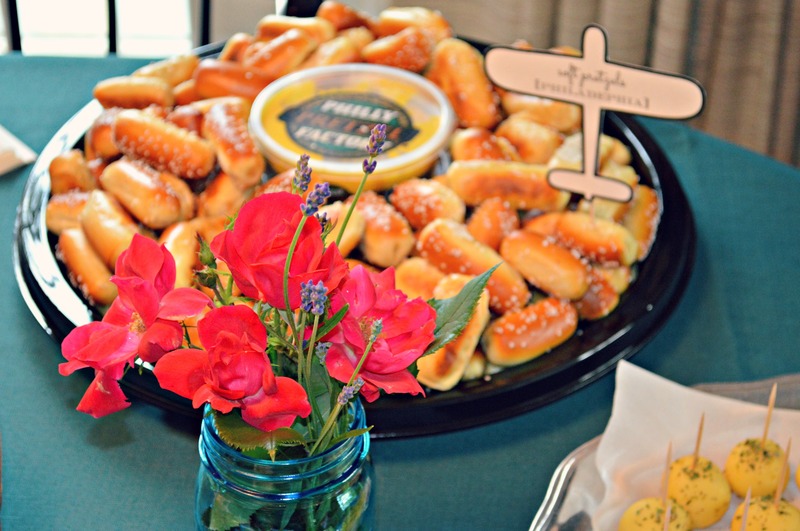 Our appetizer spread included a big platter from Philly Soft Pretzel Factory, for what could be more representative of Philadelphia than soft pretzels? 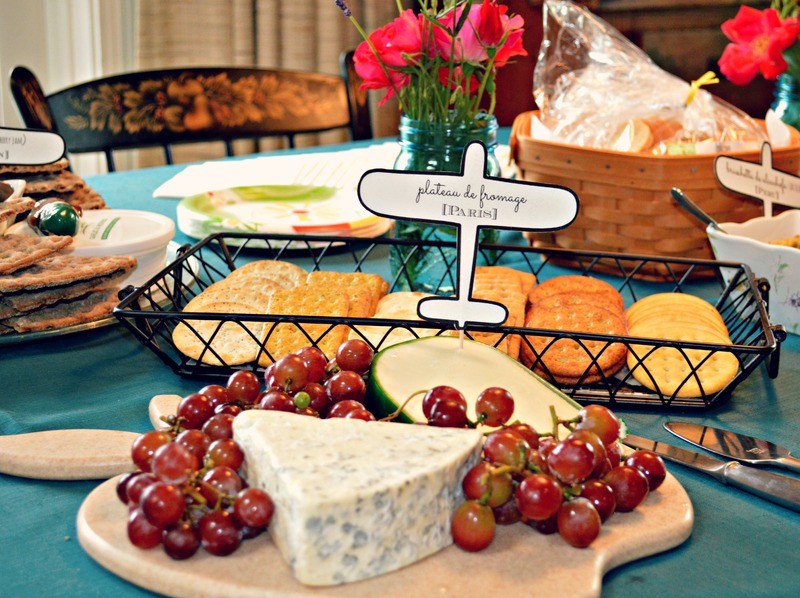 We had cheese and crackers (plateau de fromage) to represent France, and a tray of thin rye crisp bread, cheese, and sweet & yummy lingonberry jam – a common preserve eaten in Sweden. I ordered some of our international fare from World Market, including the crisp bread, jam, and two jars of bruschetta made in Peru – an artichoke spread and an artichoke & piquillo peppers – all of which were delicious! 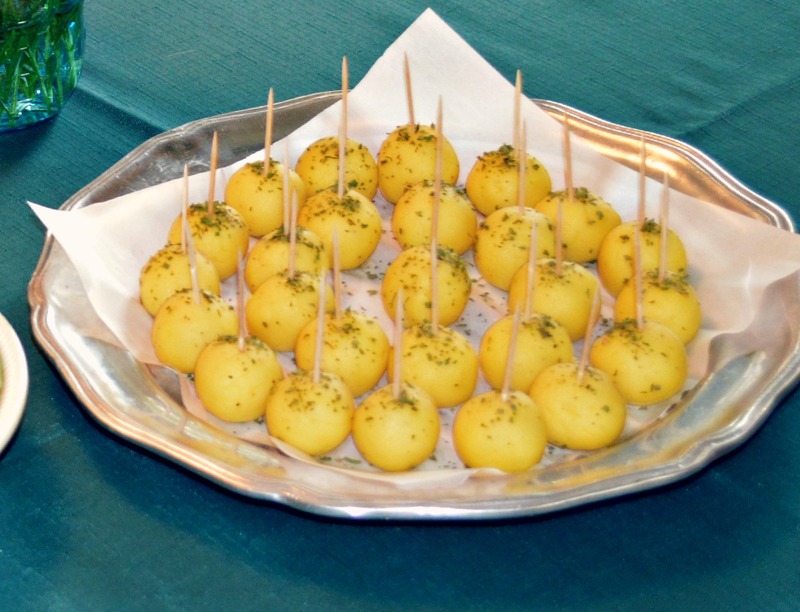 The star of the appetizer table was definitely the bolitas de causa served with huancaina sauce, a Peruvian dish made all the more authentic because it was prepared by Mili, Priscila’s mother! Mili knew these were a favorite of Priscila’s, and we all learned why very quickly – they are absolutely delicious (made with potatoes and other magical ingredients), and the sauce (a spicy cheese sauce) was killer. I will be getting the recipe from Mili for sure! Lunch was primarily ‘American’ – deli mean sandwiches and a salad. We also served Swedish Meatballs (bought a package of frozen ones from IKEA), and Deviled Eggs (made by my wonderful Aunt Susan!). Dessert, my friends, was clearly the highlight of this whole event. We had Red Velvet Cupcakes (Priscila’s favorite, homemade by my mother), Chocolate Chip Cookies (homemade by my grandma), Coconut “Cocadas” or Macaroons – made by me using this Peruvian recipe, and a suitcase full of Peruvian chocolates & candies brought by Mili. 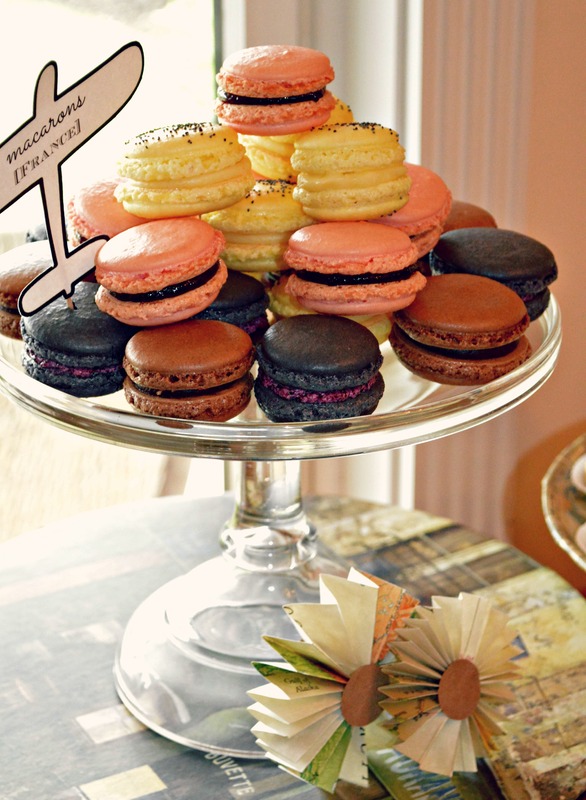 These delectable & fluffy macaróns came from a great little french bakery in Quakertown, PA (my hometown) called Moussey Moose. 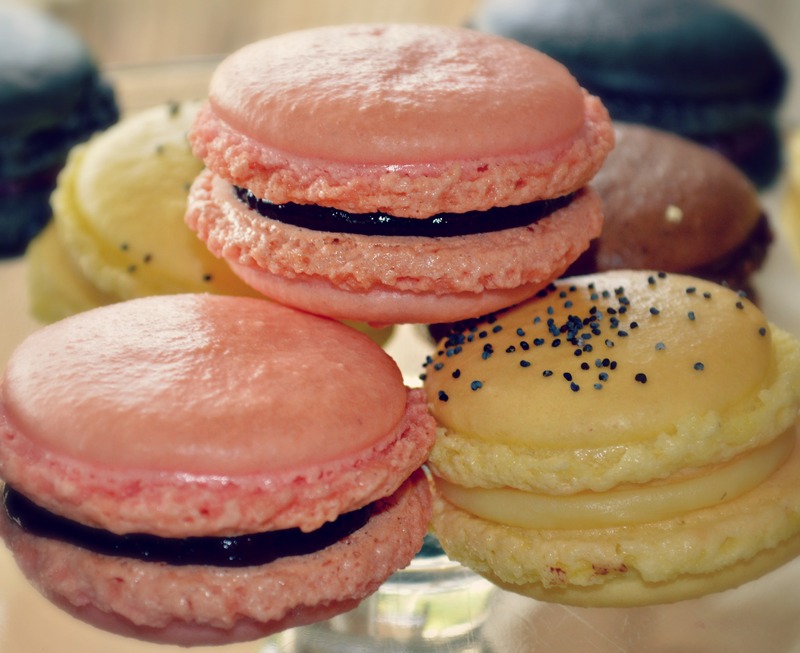 We had chocolate, raspberry, and lemon poppy flavored – and they were quite possibly the most delicious things I’ve ever tasted. 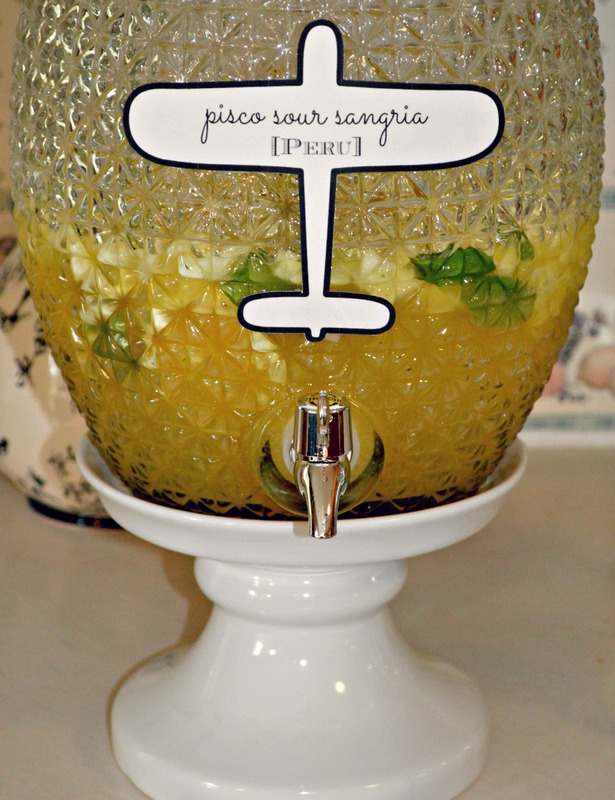 And we can’t forget the drinks: unsweetened iced tea and Pisco Sour Sangria – a delicious version of sangria that uses Pisco, a popular Peruvian brandy. I followed this recipe and will definitely be making this again! 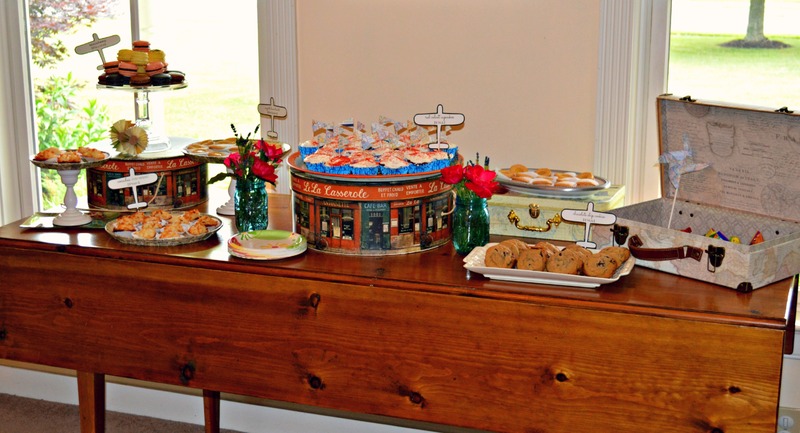 My mouth is watering just thinking about all of the delicious food we served! It was like a trip round the world on a plate! 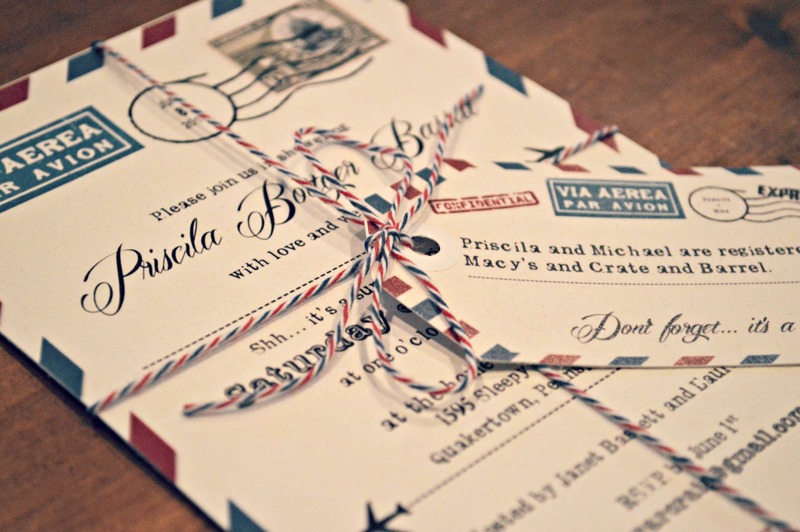 I had so much fun designing the invitations and all additional paper goods for my wedding last year that I knew I wanted to try my hand at designing the invites for our travel themed shower for Priscila. 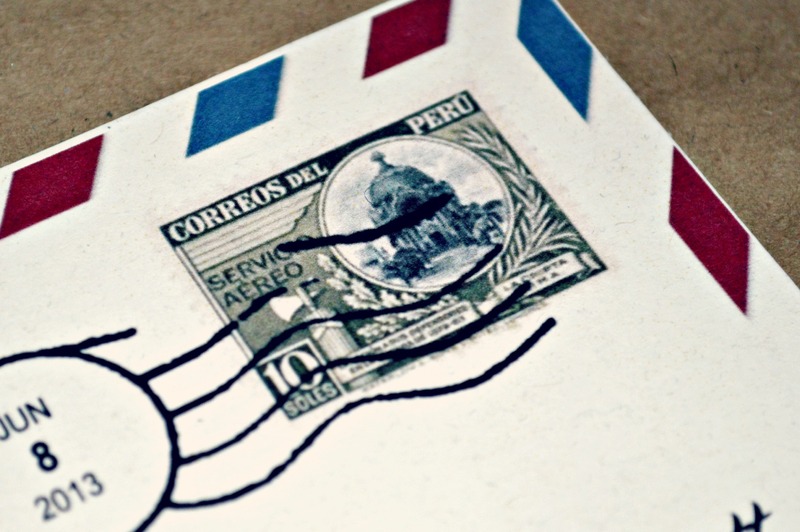 The invitation features the recognizable ‘airmail’ colors border and some carefully selected images – like a Peruvian stamp, the Spanish mark for air mail, and a postal mark containing the shower date! The fonts are Mardian for her name (the complete name looks so lovely in this font, but I blurred it out for privacy purposes! ), Rubber Stamp for the main text, and Vintage One as an accent font. 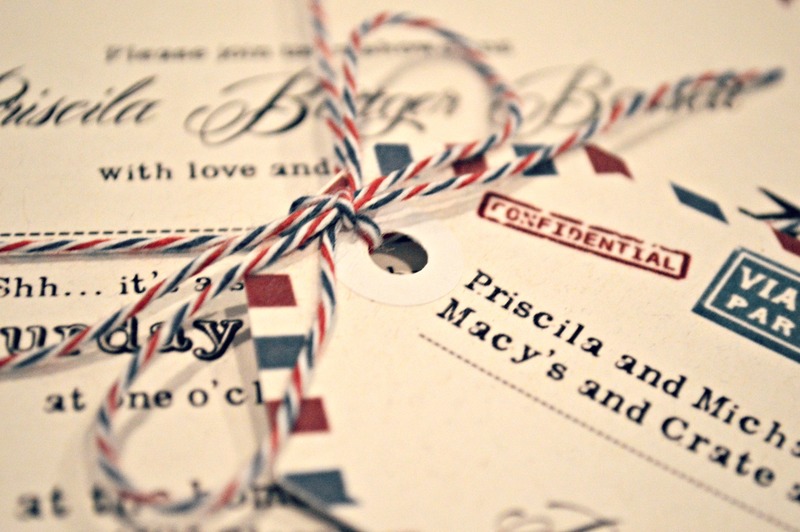 Tied to the main invitation is a card cut to mimic a luggage tag, featuring the couple’s registries. I had the invitation pieces printed at Staples, but provided my own paper which I ordered from my favorite paper supplier, Paper and More. I ordered all of my wedding paper from Paper and More, and absolutely could not be more impressed with their selection, service, and quick shipping speeds! I cut the pieces to size using my Martha Stewart paper cutter. 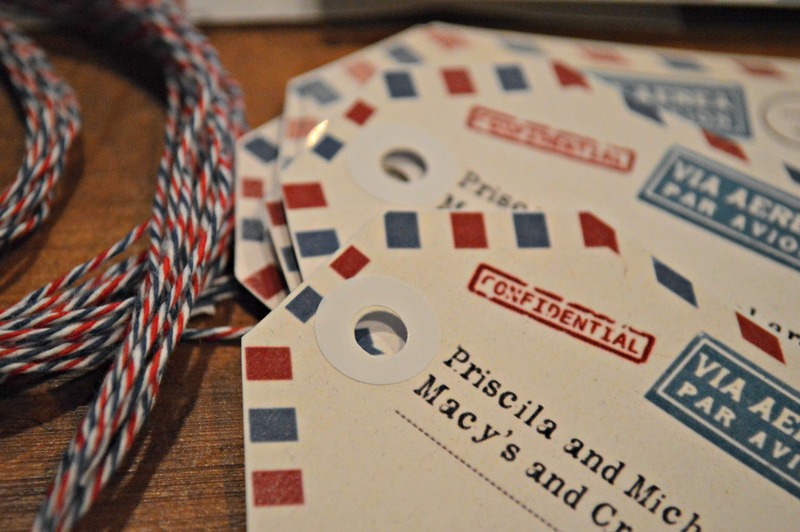 Then, I punched the tops of the luggage tags & placed little white paper reinforcements to achieve the ‘luggage tag’ look! 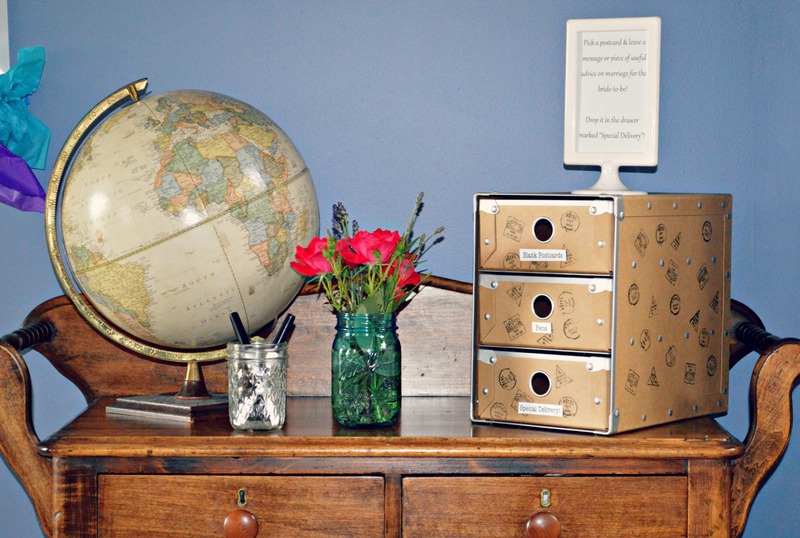 Everything is tied together with my favorite craft supply – baker’s twine! 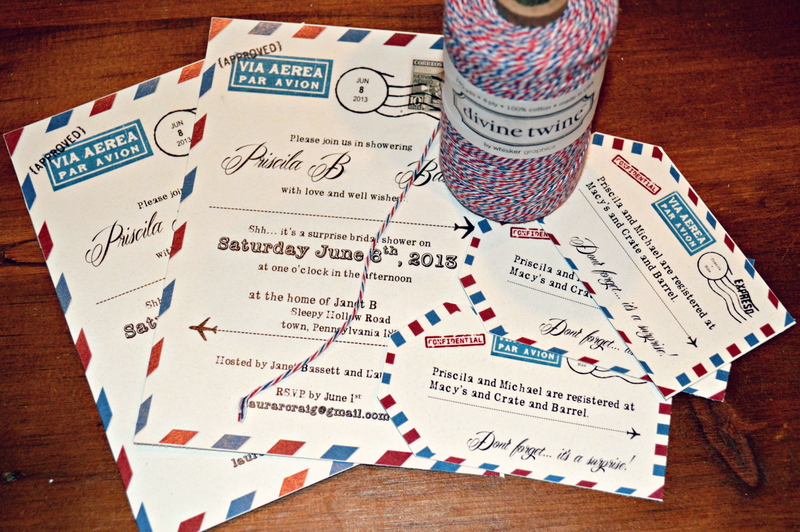 I love this “Airmail” twine, from Whisker Graphics via Amazon. 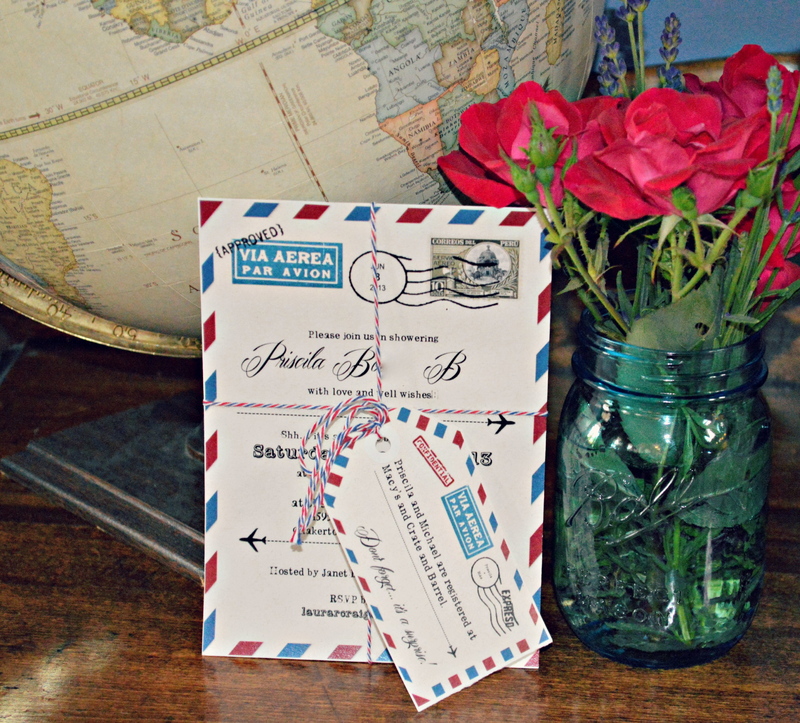 There you have it – a super personalized invitation for our surprise, travel themed bridal shower! 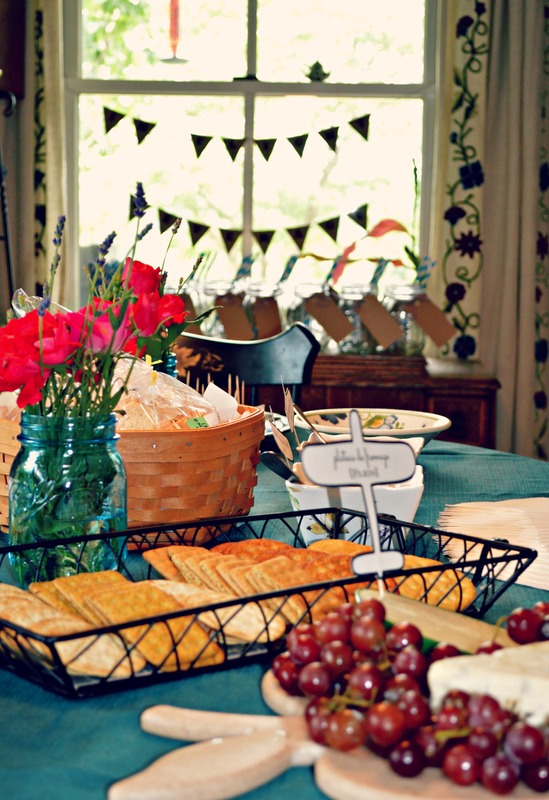 Our surprise bridal shower for Priscila was so much fun to plan & create for. 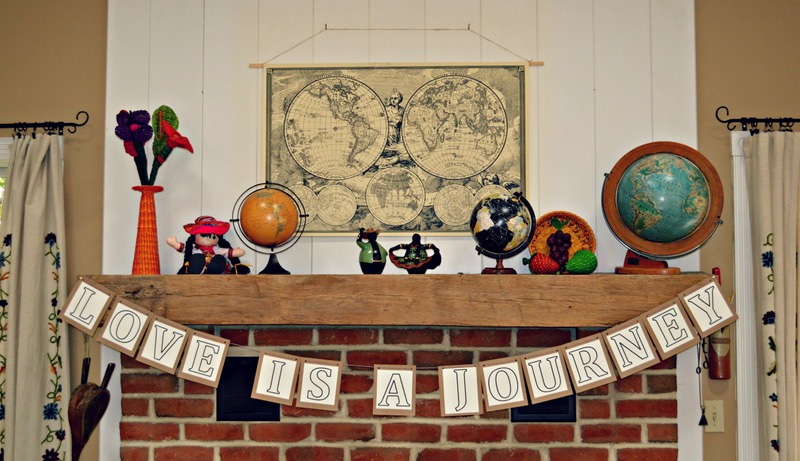 I’ll be sharing projects and highlights in posts to come, so today I will begin with an overview of the theme & party and some of my favorite decor details! Priscila gave me the flowers – they are handwoven & crafted by Peruvian artists. The mantle features, in addition to some of our favorite globes, a collection of Peruvian souvenirs given to my mother and I by Priscila over the years. Traditional Peruvian art and design is so brightly colored – and so we totally embraced the bold, bright and cheerful colors! Additional decor details included DIY garlands and beautiful fresh flowers cut from my mother’s garden displayed in blue mason jars. 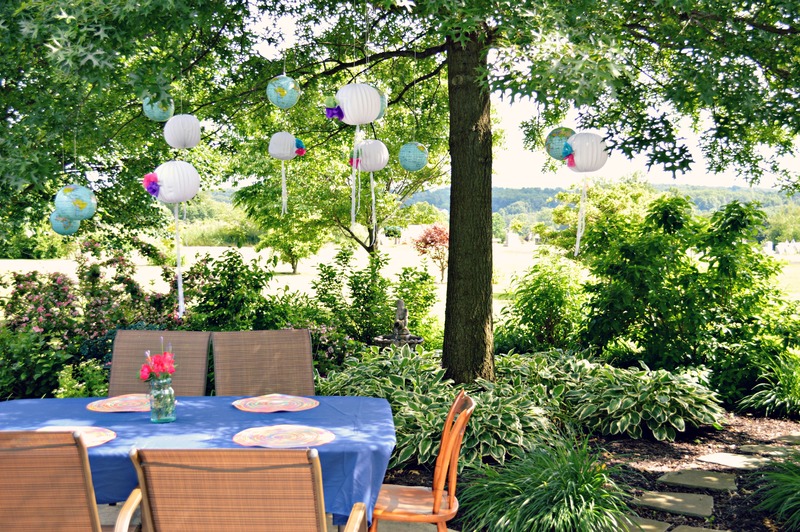 followed closely by the magical setting we created on the back patio, by hanging inflatable globes and paper lanterns adorned with tissue paper flowers from my parent’s beautiful oak tree. 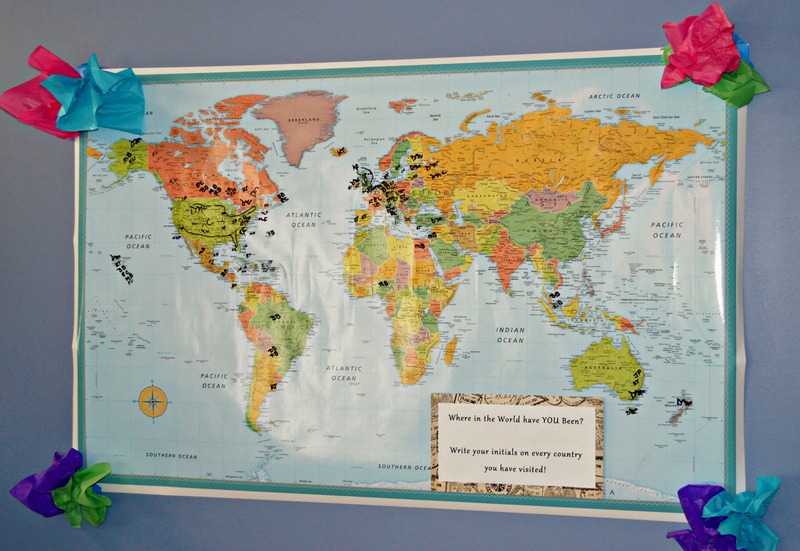 And set up an interactive area in the foyer, where guests were invited to write a postcard to Priscila & leave their initials on every country they’ve visited on a large laminated map! Stay tuned for more details & DIY tutorials. At the completion of the series, I will post a full list of projects & vendors/sources! This past Saturday, my mother, maid of honor, and sister-in-law/bridesmaid threw me an absolutely lovely bridal shower at my parent’s home in Pennsylvania. Since my fiance and I live in New Jersey, and his family/the majority of our mutual friends are from New Jersey, I already had an AMAZINGLY beautiful shower (hosted by my future mother-in-law and my bridesmaids) in August. 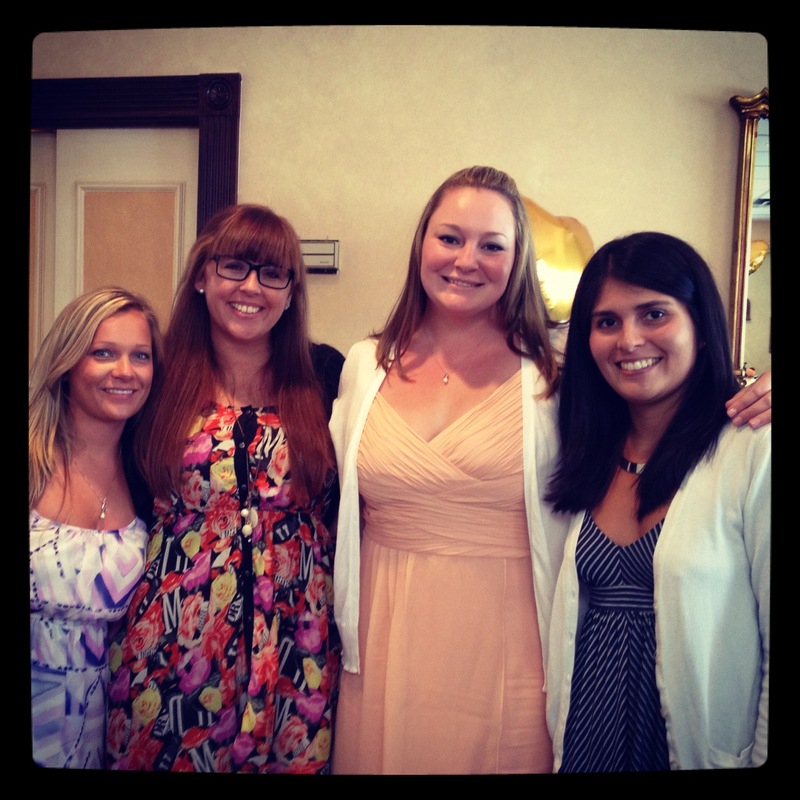 So lucky duck that I am, I got to celebrate my impending nuptials surrounded by lovely women TWICE! This shower was primarily for my family, who live in various parts of Pennsylvania. Many of my family members drove several hours to spend the day with me, and for that I am so grateful! 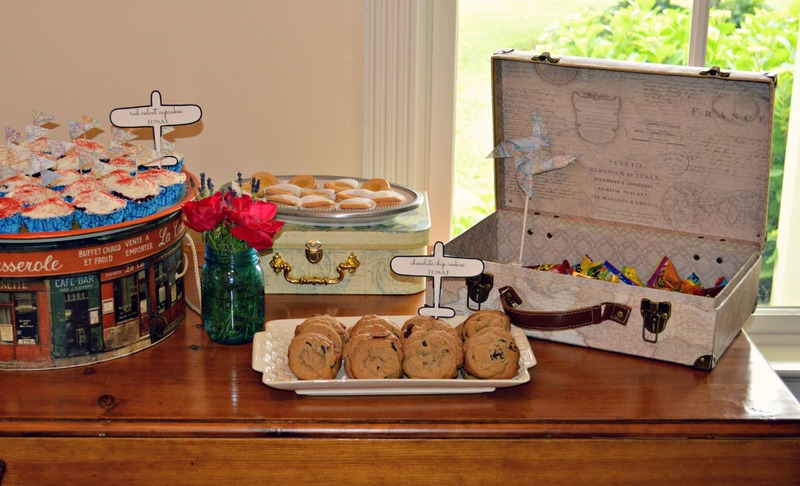 The biggest difference for this shower was that it was not meant to be a surprise, and so I was at my mother’s house helping with preparations & getting sneak peeks (and sneak tastes) of all of the amazing things my bridesmaids conjured up for the special day. It was a real treat, and meant I got to spend even more time with the amazing ladies helping me through this crazy wedding process. It was a beautiful day, and the first day of fall. It was warm- maybe even in the low eighties, but there was a strong wind. The threat of rain held off until evening, so we lucked out! 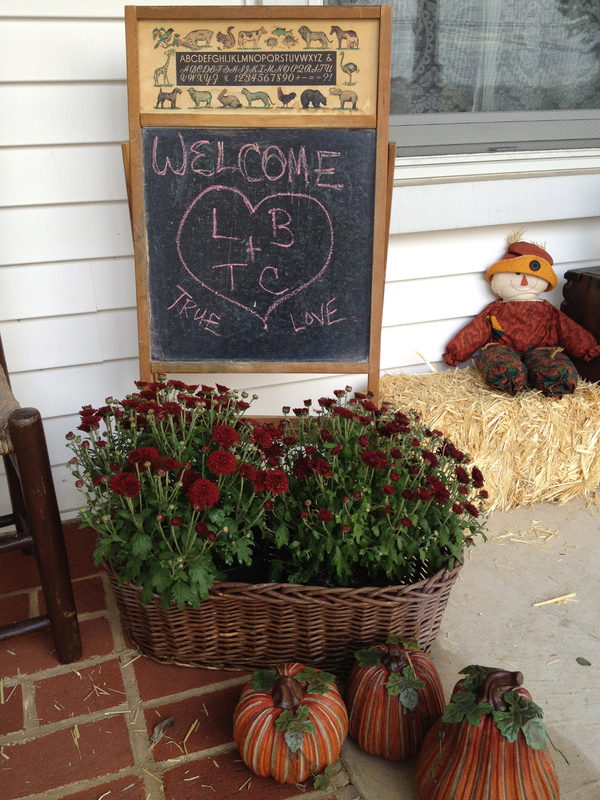 Here’s my parent’s house all decked out for fall. Beautiful, right? My mother and father both love to work in their gardens, and have plenty of space to go garden-crazy in. 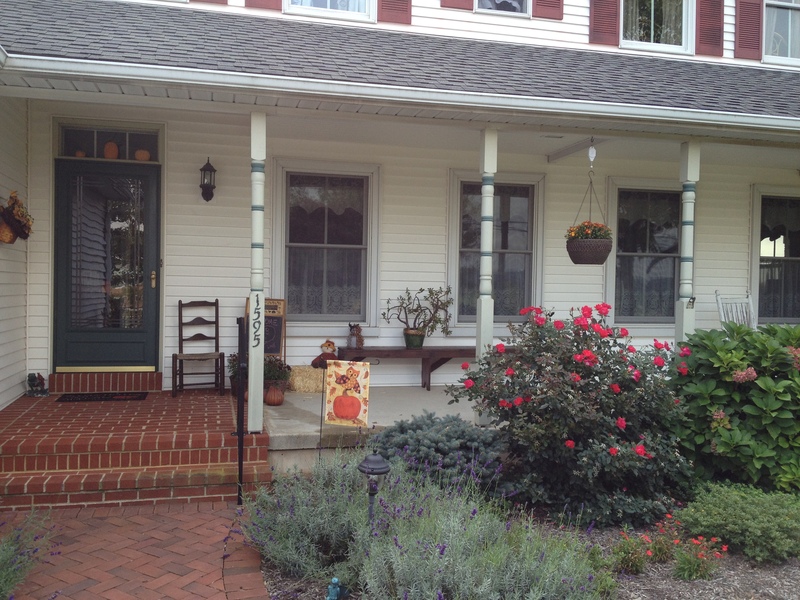 Someday I’ll take you on a tour of my mother’s gorgeous home & landscaping. My maid of honor Becky is an all-out, party-planning rockstar. Besides being one of my best friends in this universe, my go to girl for pretty much everything, and the girl I do crazy things with, like drive to Pittsburgh and back in a day and a half, Becky is SUPER organized, creative & giving. She will do anything for pretty much anybody, and I am no exception to that rule. 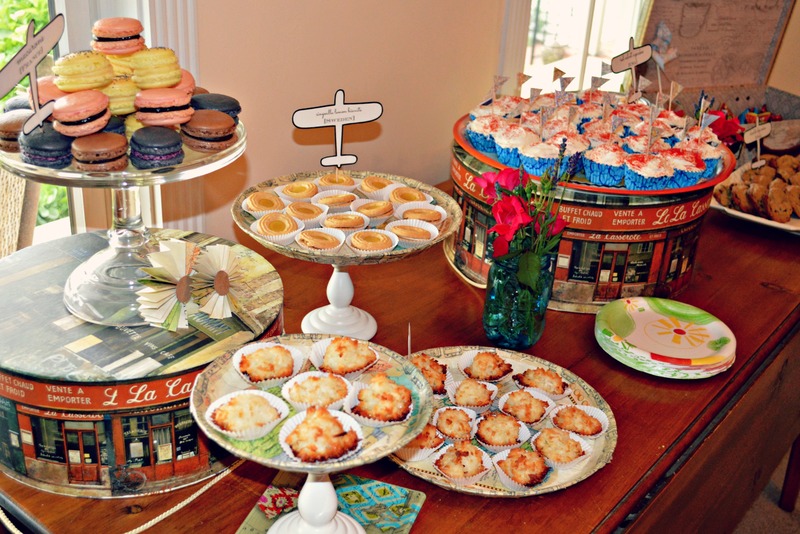 Just look below at the delicious pumpkin & cream cheese cupcakes she baked & decorated with hand cut & lettered umbrellas. 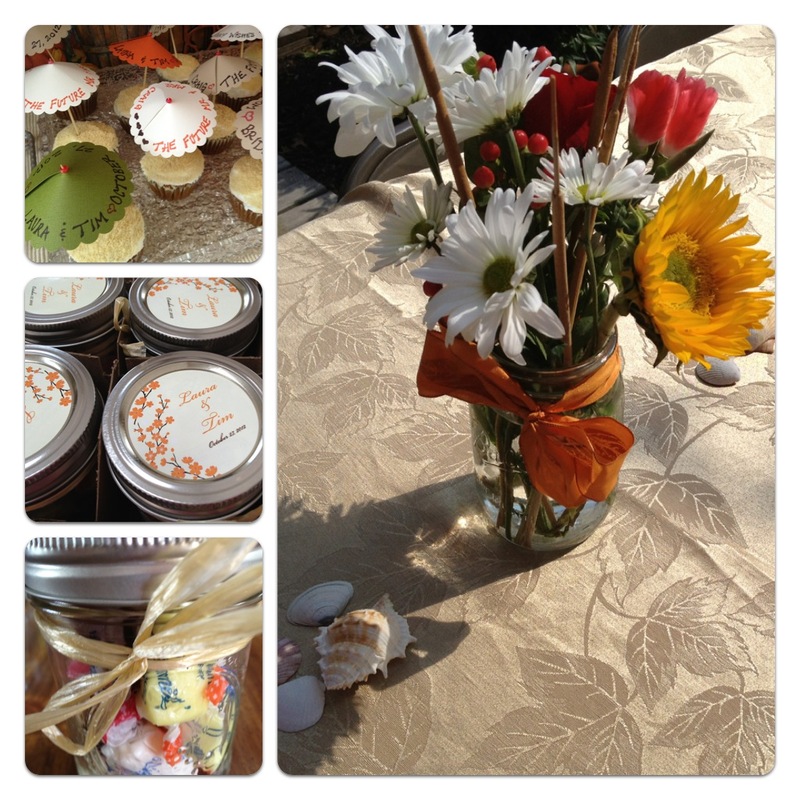 (The shower theme mixed the end of summer/start of fall, and our fall-themed wedding with Tim’s & my love for the beach- it was perfect!). Those cupcakes were to DIE for, and Becky promises to share the recipe. Below the cupcakes, you can see the favors Becky handmade- little mason jars filled with Salt Water Taffy (YUM) and topped with a sticker commemorating our wedding day. I love how they were tied with raffia- so perfect. 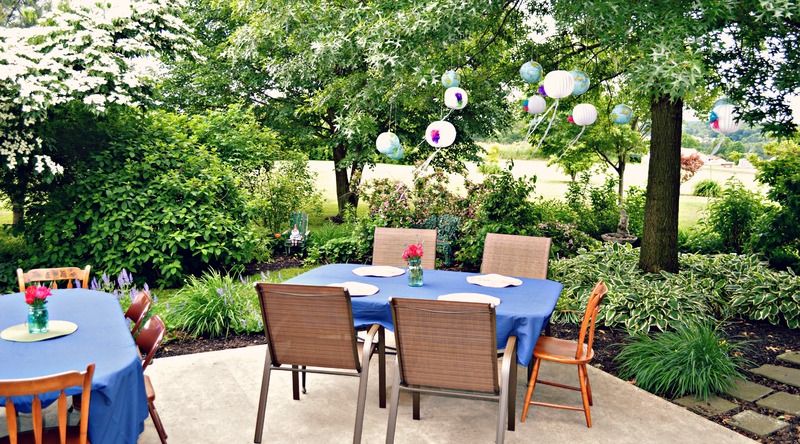 The outdoor tables were covered in pretty gold cloths my mother found, and decked with mason jar arrangements of colorful flowers (featuring my favorite, daisies), and scattered with pretty seashells. We enjoyed a delicious lunch of sandwiches, Becky’s amazing homemade seafood chowder & tossed Ceasar salad. My sister in law Priscila, who is from Peru, made amazing peruvian treats that I still cannot pronounce, but tasted like heaven. Taking the prize for the most unique shower gift any bride has ever received anywhere (in my opinion), is this “Dingerwocker” gifted to me by my mother. My mother is known for the occasional odd gift, however this one really took the cake when I opened the bag. I was delighted, however, to learn the story behind the item. When taken apart will do its’ share. my arms are clothespins to pin the clothes for you two. one a soup ladle if such a thing the bride can make. The other a turner for hubby’s hot cakes. for corn cobs aren’t just always as plenty. just a tea towel, to be used after the feast. Are you scratching your head? I was too. 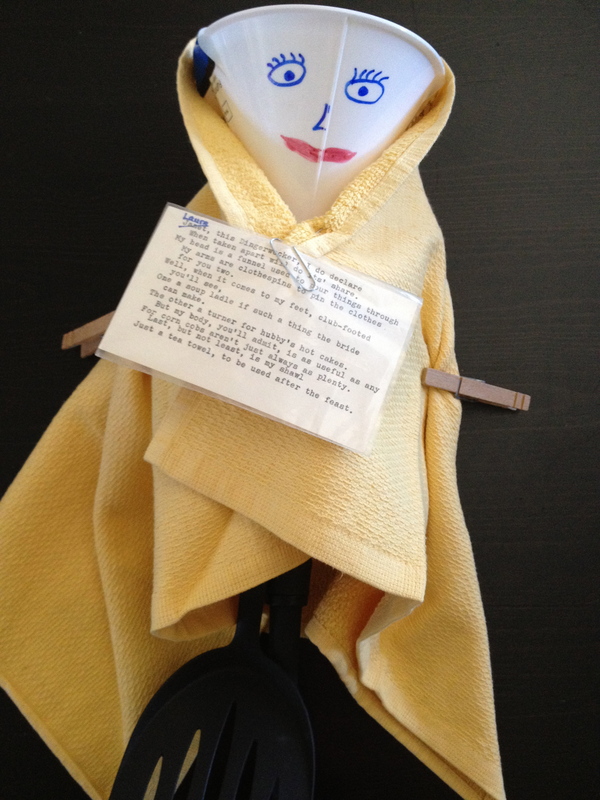 And the ‘body’ is a roll of toilet paper, so re-read lines 8 & 9 to see if you can put THAT together. My mother explained that her mother (my Mommom) was given the same gift for her wedding in 1953, by my grandfather’s sister (my Great Aunt Ruthie). She said that she “google-d” & researched this poem and gift, but learned nothing about the origins of the idea – though she assumes it comes from a Pennsylvania Dutch tradition (which fits with my family background). 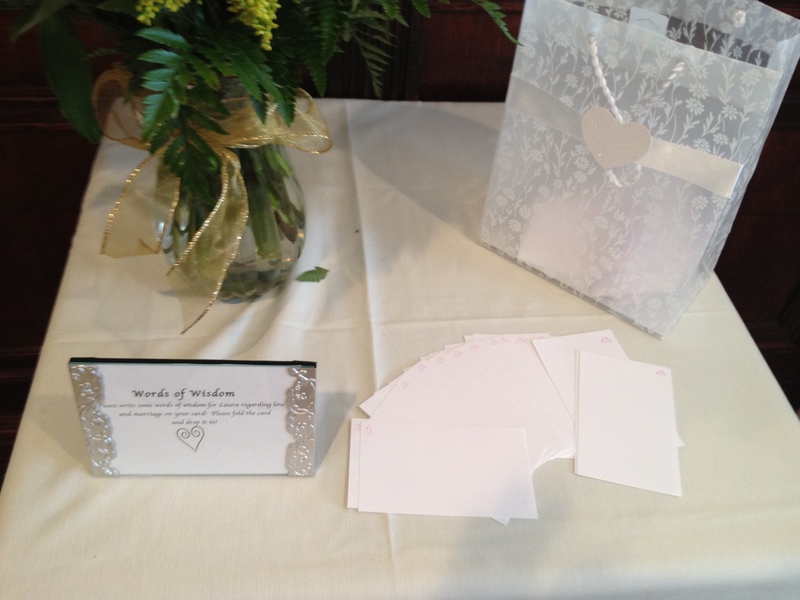 I love this idea, love the time and thought that went into making it, and love my bridesmaids. Love all around, people. 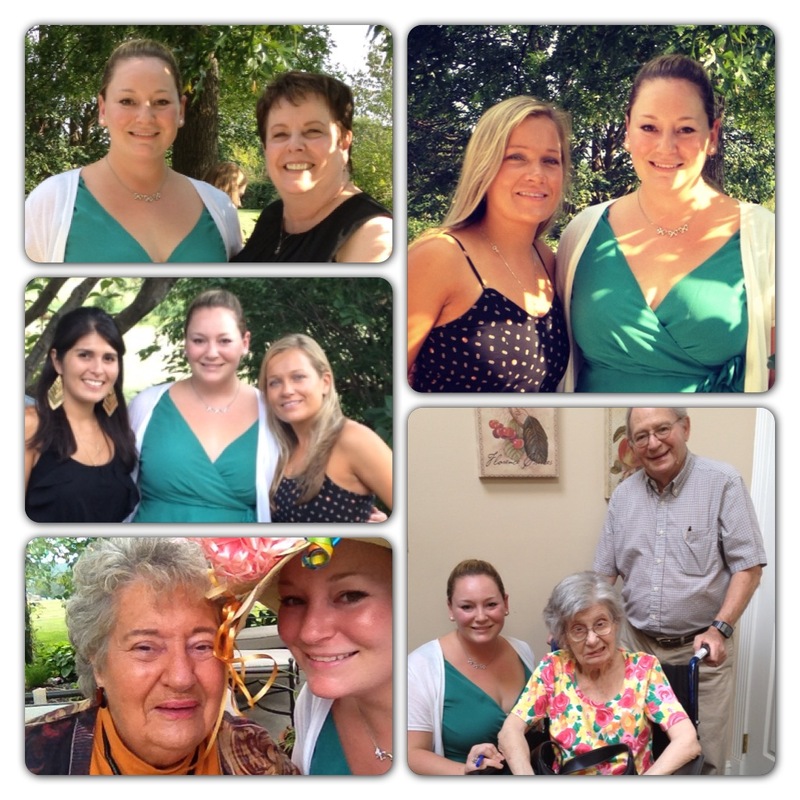 From top left- me with my future mother in law, me with my MOH & Rockstar bestie Becky, me with my Mommom & Grandpop, me with my Grandma (and awesome bow-hat), and me with my sister-in-law/beautiful bridesmaid Priscila & Becky. What was the craziest/coolest/most interesting gift you received (or gave) at a shower? 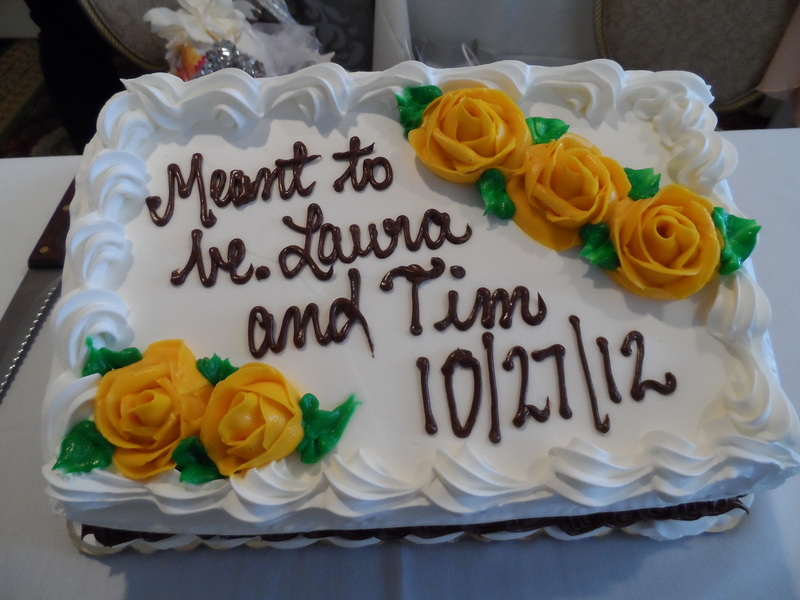 Planning a wedding between two people whose families live in different states can be challenging. Even for FH & I, with family in Pennsylvania and New Jersey separated by only a few hours, every wedding event is slightly more complicated because one group or the other will have to plan for a drive. Fortunately for me, my bridal party, mother and future mother-in-law (we’ll call her FM!) opted to shower me with pre-wedding love & attention not once, but twice! What a lucky bride I am! Shower #1 was meant to be a surprise- and although I bullied FH into leaking some of the details in advance, I was still thrilled and blown away at the lovely party my FM and bridesmaids put together for my New Jersey – based shower. 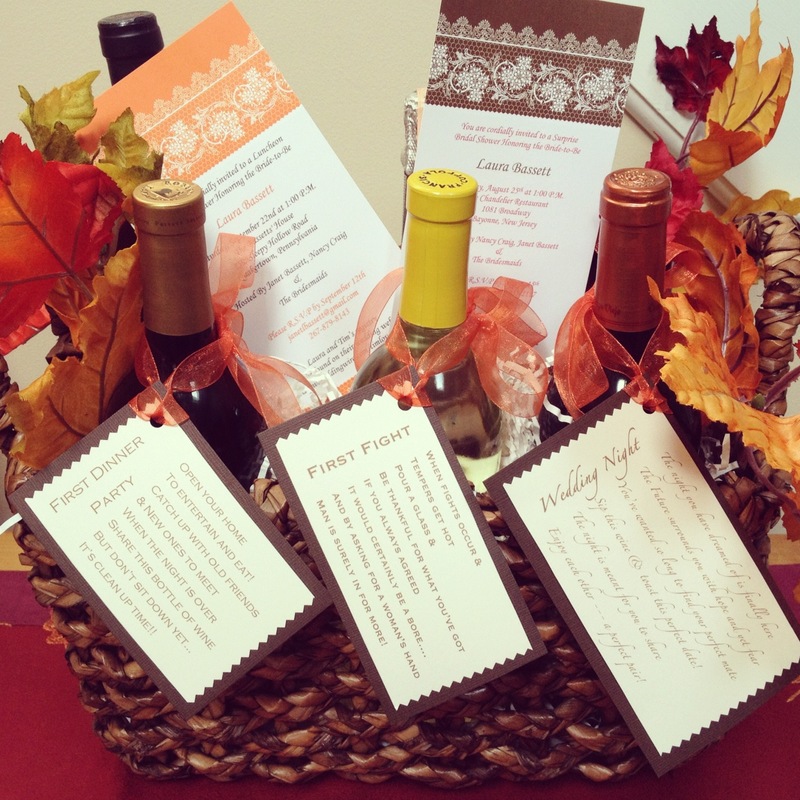 Walking into the room, feeling 99.9% sure I would be greeted with a “surprise”, I was overcome with nerves! As a performer, I’m pretty used to being in front of, and attempting to entertain, a large group of people. This felt very different, however, since I knew it would be such an intimate, personal, excitement & emotion-packed afternoon. I was totally shocked at some of the amazing friends who traveled to be there, and had the pleasure of meeting some of FH’s family members I had not yet met (though I’ve been studying their names on my Google Doc Wedding Guest List for months now!) I was overwhelmed at the outpouring of love from my Jersey friends (who have completely captured my heart after these 5 years living here), my bridesmaids (who must certainly be the best bridesmaids anyone has ever had), my darling mother, and my wonderful future mother-in-law. 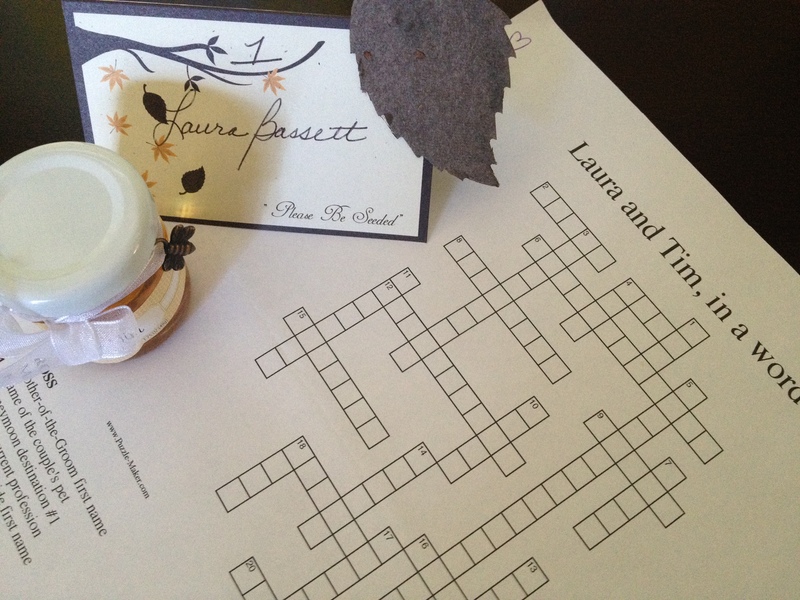 My bridesmaid Meg created a crossword puzzle featuring tidbits of info & details from our relationship. It was so clever and sweet- I loved it! 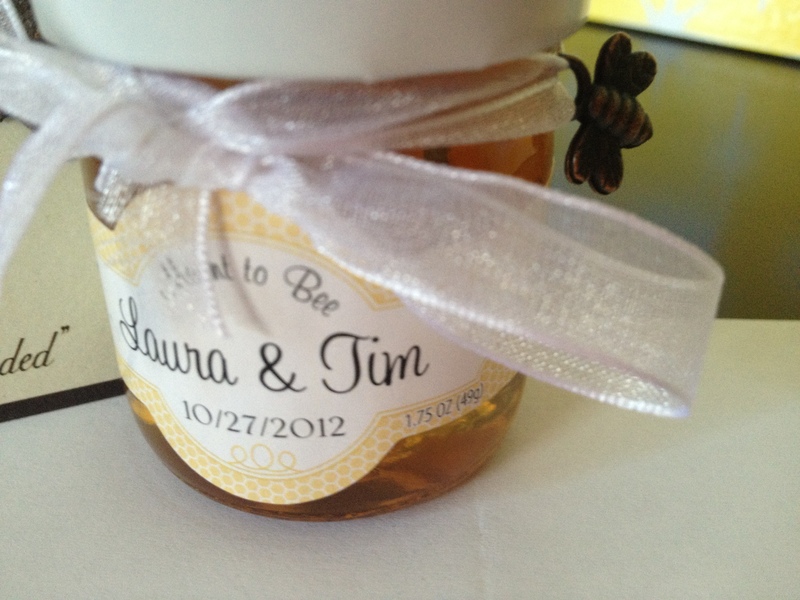 Mini jars of honey were the adorable favors – I loved the little bee charm on the ribbon! 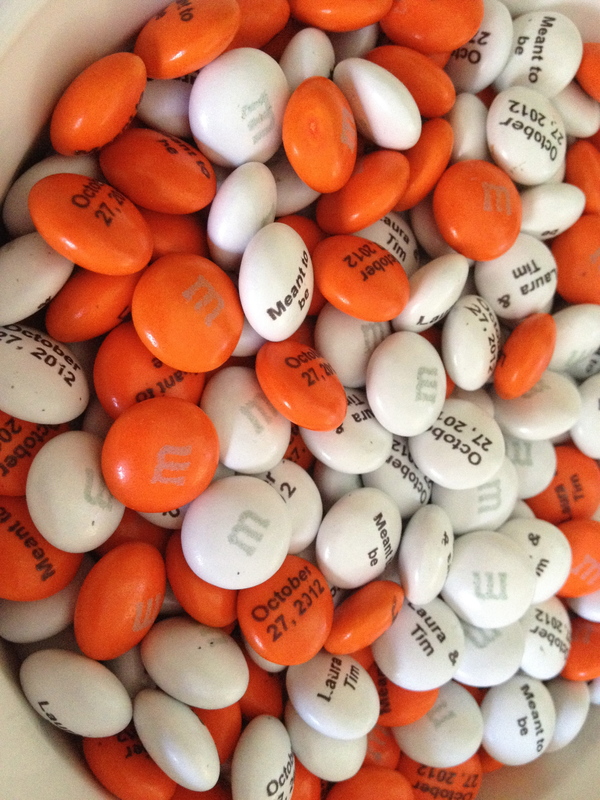 On each table was a bowl of orange (one of our wedding colors) and white M&Ms, with our names & wedding date! Possibly my favorite moment at the shower was, after opening all of the amazing gifts, going through this bag full of advice & loving sentiments from friends and family. 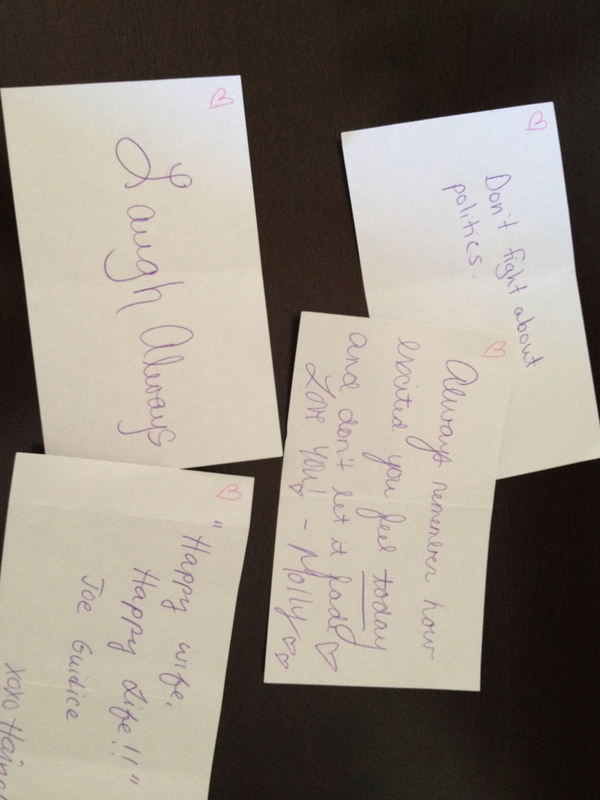 We got some great advice, from getting a King sized bed & cleaning service, to remembering to laugh & enjoy each other.